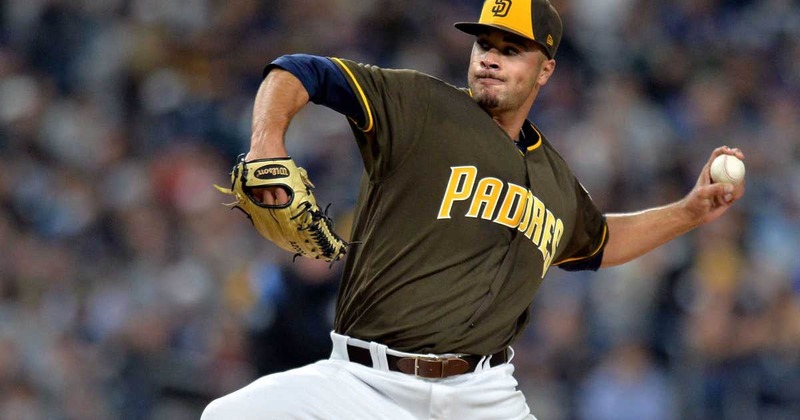 SAN DIEGO– Through four major league starts, Joey Lucchesi has dazzled the Friar Faithful to the tune of a 1.66 ERA, 10.38 K/9 rate, and a 2-0 record. He was not necessarily expected to be up with the Padres this soon, though. Lucchesi was drafted in the fourth round of the 2016 draft and made his professional debut that summer. In 2017, the southpaw had a 2.20 ERA with 148 strikeouts in 139 innings while splitting time between A-Lake Elsinore and AA-San Antonio. Many looked at him as a prime candidate to start 2018 in AAA-El Paso for some seasoning before being promoted to San Diego. An impressive spring training performance sped up his timetable, though. Lucchesi struck out nine in 11 2/3 innings while giving up only two runs, showcasing big-league ready stuff. Once RHP Dinelson Lamet was sidelined with an elbow injury, the Padres promoted Lucchesi to make his MLB debut in the second game of the season. His impressive early-season performance has made him a staple in the Padres rotation. The 24-year-old recently sat down with Fox Sports San Diego’s Lisa Lane to discuss a variety of topics; including his college experience, major league debut, working out with Clayton Richard, and which player from the minor leagues he is most looking forward to seeing as a Padre. Check the video out above!